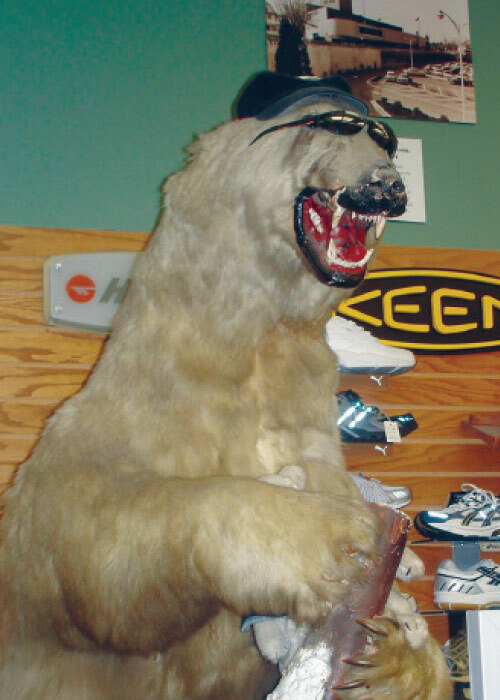 Peer in the front window of Towson Bootery, and you’ll see a genuine stuffed polar bear rearing up on its haunches amid the latest family footwear fashions. Unexpected and memorable, with an interesting history, the bear is a lot like the store itself. At a time when independent retailers are almost an endangered species, this 68-year-old, family-owned stalwart in Baltimore County, Maryland’s Shops at Kenilworth mall is still going strong. 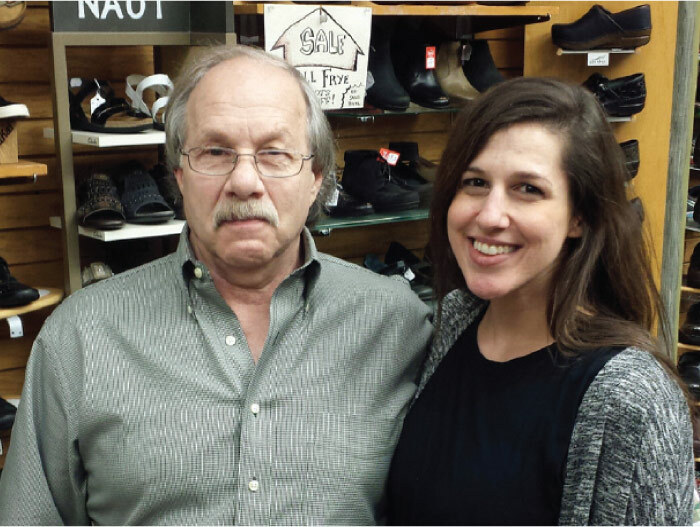 In fact, father-daughter team Alex and Stefanie Rudolph are in the midst of a major renovation that will contemporize decor and streamline layout in the 2,000-square-foot store. The bear stays, of course. As the Rudolphs know, some things are worth preserving. Among them: personalized service, fitting expertise and a bit of history. “At first, mall management didn’t want us to take our polar bear with us, but then they realized it’s our signature,” explains 34-year-old comanager and buyer Stefanie Rudolph of the bootery’s temporary move to the second floor. The relocation is part of a mall-wide revamp that’s underway at Kenilworth as the 30-store shopping center prepares to welcome a Trader Joe’s later this year. “Everybody knows the polar bear. Kids look for it and parents remember it from when they were little. It’s been with us since we were in our first location on York Road,” Stefanie explains. Father-daughter duo Alex and Stefanie Rudolph. R. Richard Rudolph—father to Alex and grandfather to Stefanie—opened his York Road shop back in 1948, when the street was the bustling downtown center of Baltimore County. 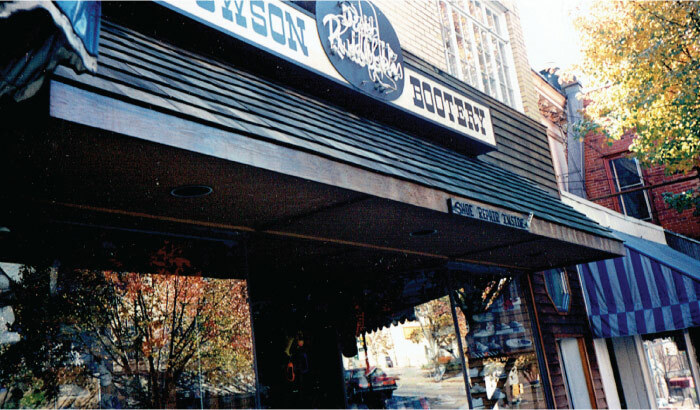 Even then, Towson Bootery was the little shop that could, opened on a shoestring and flourishing thanks to the dedication and diligence of the gregarious Rudolph family patriarch, who earned himself a reputation as the unofficial mayor of Towson. “Back when my dad was running the business, people would come in and say, ‘I can’t pay you, Mr. Rudolph, but can you let me take the shoes and I’ll send you a check?’ He kept records of who owed what. It was a different way of doing business. My father was very personable. People gravitated to him,” remembers 68-year-old Alex. In those days, young Alex would often board one of the streetcars that trundled along York Road to his dad’s shop, where he’d spend Saturdays cleaning, polishing, running stock and repairing shoes. His biggest fear as a 12-year-old was waiting on customers. Hear me roar: the store’s honorary mascot. By the 1970s, York Road was falling on hard times. Busses replaced streetcars and parking grew scarce as office complexes encroached. 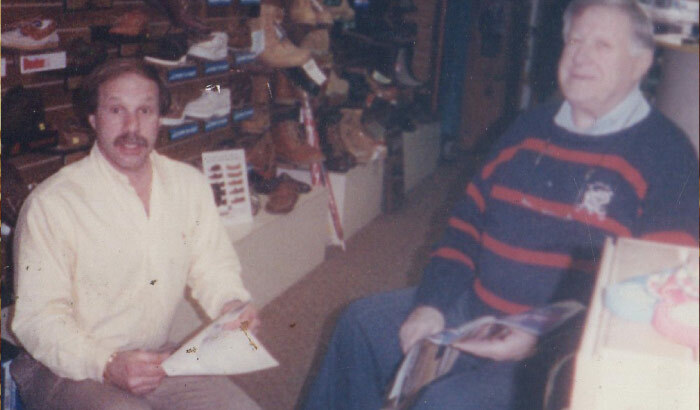 Then a mega mall opened with a Nordstrom and a slew of other footwear stores a mile away, recalls Alex, who began managing the business when his dad went into semi-retirement in 1980. Towson Bootery moved across the street in 1976 as the nation celebrated its bicentennial (the sight of a polar bear crossing York Road stopped traffic, the Rudolphs recall), but even this wasn’t enough. By 1996, it was time to go. Alex chose The Shops at Kenilworth as his new site for its small scale and family-friendly vibe. Happily, the move paid off. Loyal customers sought the store out in its new location (perhaps recognizing the bear in the window) and usually found three generations of Rudolphs on hand to welcome them. “Pop-pop said he was retiring, but he didn’t really,” remembers Stefanie, who, like her dad, grew up in the family business, stamping checks, sweeping and doing odd jobs. “He would hang out in the mall with his friends. Everyone knew him. He was very giving, very generous,” she adds of her grandfather, who was known for supporting local charities, donating food to the needy and giving shoes to those who couldn’t afford them. Though he passed away in 2002, Richard Rudolph’s legacy lived on. 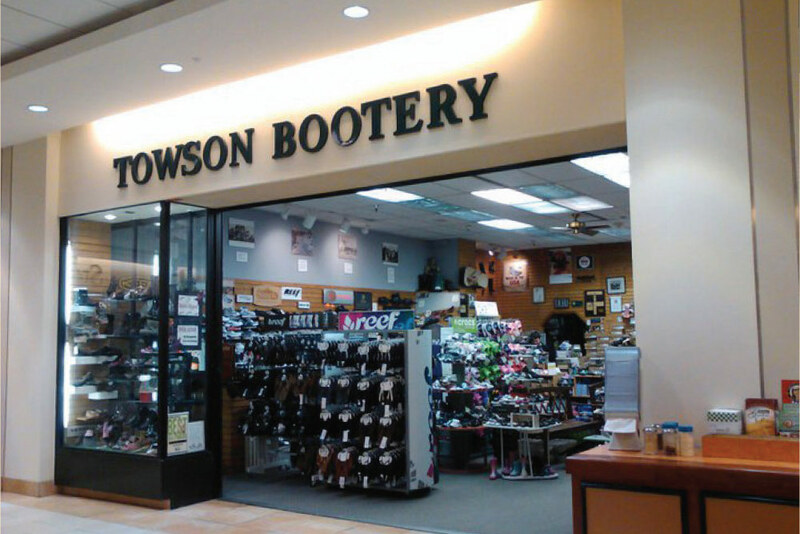 Towson Bootery’s original location on York Road. A bevvy of popular private schools in the area also brings Towson Bootery a healthy dose of kids’ footwear sales to complete school uniforms, Alex adds. (Sperry Topsiders are a popular choice in this category, he says.) Ballet, jazz, character and other dance shoes round out the store’s children’s sales. “Back when my father owned the store, he had what looked like a real miniature tree with branches cemented into a big pot. He drilled holes in the branches and stuck lollipops in them,” Alex says. Today, they keep things simpler, with a container of lollipops and a gumball machine holding prizes to reward pint-sized shoppers. Adding to the small shopping center’s appeal are seasonal events like store-to-store trick-or-treating, which draws about 300 kids every Halloween, and festive model train displays around Christmastime and other holidays. “I grew up in this business, so I’ve met all these different families through the years. Now I see their kids getting married and new generations coming in and trusting me and my daughter and my girlfriend, Beth Hankin. I see them leave the store feeling good about their purchases, and that makes me feel great,” says Alex. Inside, the classic sit-and-fit setting. She also promotes the store on local online community sites for parents like Mobtown Mommies and connects with The Shops at Kenilworth’s Facebook and Twitter accounts. “If I post something, the mall will share or retweet it, and they have a huge social media following,” she says. Father and son, Richard and Alex Rudolph, on the floor—as always. That’s not all that’s changed through the years at Towson Bootery. Trends from x-ray machines to dyeable shoes have come and gone. 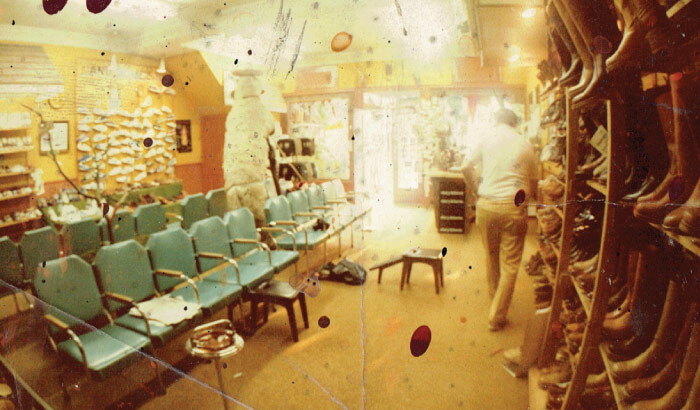 The store still offers shoe repair, with the majority done by an expert offsite, but the Rudolphs keep a close eye on what sells and what stays on the shelves. “Trends change all the time,” says Alex. “If it’s not hitting, I’ll buy less or jump off. I’m always looking for new things to try and introduce to freshen things up. Right now, Alex feels “rejuvenated” by the redesign. “After 20 years at this location, it’s time for a facelift,” he says. Plans call for new display cases, metal shelving to replace old wooden shelves and a switch from carpeting to hardwood floors to achieve an uncluttered look that will make navigating the many brands the store carries easier for customers. Which brings us back to the bear. Legend has it the specimen was brought back from one of famed explorer Admiral Byrd’s arctic expeditions. From there, it found its way to a furrier, a nightclub, a car dealership and even to the set of the early 1950s TV show Arthur Godfrey and His Friends before Towson Bootery’s founder gave it a permanent home in his store in the 1960s. Apocryphal or not, the story adds to its allure. “There’s a lot of history with this bear,” says Alex. The same could be said of Towson Bootery.